Much of the information on this sheet assumes that the patient is a child. However, most material applies to an adult as well, with exceptions that should be obvious. Generally, adult myringotomies with ventilating tubes are performed as an in-office procedure under local anesthesia. Should you have any questions concerning the differences in adult and pediatric post-operative care, please ask. Otitis media with effusion or serous otitis media is a term used to describe an accumulation of non-infected fluid in the middle ear-that part of the ear behind the eardrum. This fluid may vary from watery to glue-like. It occurs because of obstruction of the Eustachian tube, a narrow tube which connects the middle ear to the back of the patient’s nose (an area called the nasopharynx). This tube allows the pressure in the middle ear to be equilibrated with the pressure in the environment. Opening and closing of this tube is responsible for the popping sensation which is feltwhen one climbs rapidly in an elevator, automobile, or airplane. This equilibration of pressure is necessary for the well being of the middle ear. Obstruction of this tube is not uncommon in children under the age of six. It is frequently related to allergies, enlarged adenoids, or an infection. Unusual anatomical problems such as a cleft palate are also associated with persistent fluid. The infections which cause this may be either viral or bacterial. Because of this, these accumulations of fluid are often associated with repeat episodes of a cold or upper respiratory tract infection. In children this fluid is often relatively asymptomatic. Parents may notice that the child has difficulty hearing. He or she turns the television up louder or keeps saying What? when spoken to. Young children will often tug at their ears. They may awaken in the middle of the night pulling at their ears and crying. 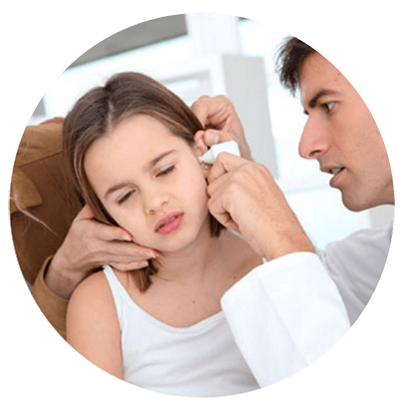 Serous otitis media tends to be more symptomatic in adults. The most frequent complaint relates to decreased hearing; sound tends to be muffled. Additional complaints include a sense of fullness or stuffiness of the ears, an awareness of one’s own voice radiating to the affected ear, or mild discomfort.